For natural hair with light thinning. For natural hair with progressed thinning. For coloured hair with light thinning. For coloured hair with progressed thinning. For chemically treated hair with light thinning. Discover our best performing products. The story of Nioxin began when an inquisitive young girl looked up at her father, saw his frustration at losing his hair and heard his wish that someone would one day find a solution. Eva Graham began to cultivate a new approach to healthy hair, starting with the scalp. It was clear to Eva that beautiful hair can only thrive on a solid foundation, and since the scalp is an extension of the face, that foundation was the skin. This is how skin care for the scalp came to be, and how Eva started out on her mission to map the journey to thicker and fuller hair. 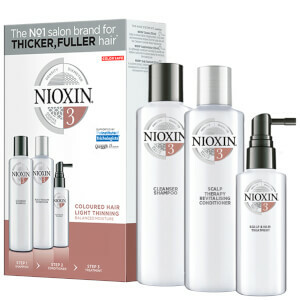 Nioxin is a specially developed hair care system to stimulate the hair follicle and improve thickness and hair growth. 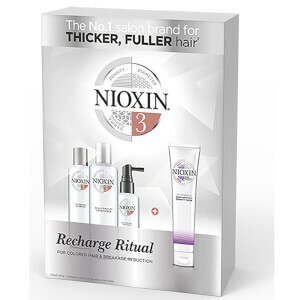 Nioxin uses advanced technologies to deliver thicker, fuller denser- looking hair. With commitment and extensive research Nioxin is able to offer help to 50% of people worldwide who experience thinning hair. Losing your hair or experiencing thinning hair can be a scary and emotional time, but with Nioxin you know not only is your hair being looked after, so is your scalp. With very few options in the past, people suffering from thinning hair struggled to find a solution, but now the Nioxin system has three stages to boost hair thickness and growth. 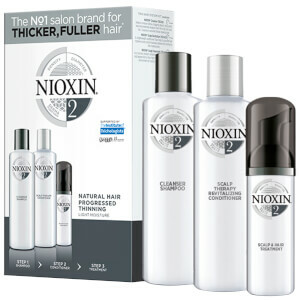 To break it down Nioxin Cleanses the hair, Optimizes it and then Treats it to give it a fuller appearance. Activ-Renewal and Glyco-Shield - The White tea extract and peppermint oil refreshes the scalp while creating a protecting agent to coloured hair, while the cleansing agents clean the hair of dirt and build up. Scalp access Delivery System - Vitamins, botanicals, SPF 15 sunscreen, and purifying agents help clean away follicle-clogging sebum and environmental residues from the scalp skin, while providing sun protection for the scalp. Smoothplex - Silk amino acids, kukui nut oil and protective conditioning agents help provide moisture balance and smoothing control, reducing loss by strengthening against damage and breakage Explore Nioxin thinning hair systems and their advanced technologies. BioAMP - Coats the hair in a light weight conditioning agent and so that it is protected and the Cystine amino acids make the hair appear fuller. With proven positive results, Nioxin hair care system at Lookfantastic provides you with professional products designed with years of expert knowledge to target the different areas of care that your hair may need. In the Nioxin range there are different systems to suit different types of hair, whether you have coloured, dry or fine hair, Nioxin has the system to suit.